The haunted Banff Springs Hotel has been referred to as the most haunted structure in Alberta, Canada. Several people visit this particular hotel on an annual basis. Nestled in the Rocky Mountains, this is one of the tourist hot spots in Alberta. Constructed as a wood structure in the year of 1888 once the Canadian Pacific Railway was put into place, a man by the name of William Van Horne determined that the area where the structure now rests would be ideal to visitors in the area. People visiting the area could enjoy the lovely mountainous scenery, as well as the hot springs that flowed naturally in the area. In this Haunted-Places-To-Go travel guide, you will learn about the haunted Banff Springs Hotel. In the year of 1926, the hotel experienced a fire. The fire completely destroyed the wood structure that once stood as a popular hotel. It was at that time in which it was determined best to reconstruct the establishment in a more sound manner. This is when the work began on the new hotel. It was built in the same manner as a castle – complete with thick walls composed of pure stone, and large towers. By the 1930’s, the establishment was up and running again. This time around, it became one of the most popular places for famous people around the world. Many would dub the Banff Springs Hotel as the “Castle of the Rockies”. 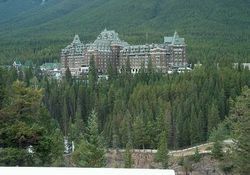 There are many hauntings that are said to occur at the Banff Springs Hotel. When the hotel was originally constructed, it seems that the contractors actually made a mistake in the architecture and created a room that was said to have no windows, or even an area for a door. It was apparently an empty room that was supposed to be kept hidden to cover up the mistake. When the original wood building burned down due to the fire, this mysterious room was discovered. Individuals have said that in the area where this “secret” room was found, there have been strange noises and even apparitions seen. It is unknown why these events seem to be linked to the room. There is a particular room in the Banff Springs Hotel that has been considered to be haunted for several years. This is room 873. It is said, in the past, an entire family consisting of a mother, father, and at least one little girl was murdered in the room. Once the police completed their investigation, the hotel staff attempted to clean the room, but there was one odd occurrence- it seems that the fingerprints of the small girl that was murdered still lingered on the mirror in the room. As a result of this unexplained phenomenon, the hotel management elected to close off the room. However, many visitors to the establishment claim that they see the spirits of the family roaming around the area of the room. Then, there is the haunting of the female bride was died while at the Banff Springs Hotel. One day, in the history of the hotel, there was a beautiful young bride who was emerging from her room and coming down the staircase. As she proceeded to the bottom of the stairs, some sort of situation occurred that resulted in her falling over the dress and down to the ground floor of the stairs. As a result of the fall, she died instantly. Shortly after the accident, many have claimed to have seen the young spirit of the bride descending down the magnificent staircase in the hotel. In addition to this, she has been seen in other areas of the hotel, still wearing her beautiful white wedding dress that she died in. Then, there is the story of a man by the name of Sam Macauley. This man worked as a bellman until he died in the year of 1976. It is believed that he still haunts the luxurious hotel, particularly on the upper floors of the hotel. Several people have identified him as a real person and have spoken to him. Out of nowhere, the man suddenly disappears right in front of their eyes! You can find this haunted hotel on Spray Avenue in The Fairmont as numeric 405. If you want to visit a haunted hotel, the Banff Springs Hotel will be one of your favorites! Check for the lowest price, get directions, view photos, and read the reviews and traveler tips for the Banff Springs Hotel.